Good news for all users of Ingress, the Advanced Access Control System. The Head of Support for FingerTec Worldwide, Aidid Sharulzaman Arifin, has compiled a list of frequently asked questions regarding Ingress for easy reference. Remember to bookmark this page or print it out, as it will save you (yes, YOU!) a lot of time and effort. Read more for the FAQ. First, go to the Start button > Select All Programs > FingerTec Ingress > Ingress DBInstaller. Now you are able to operate the Ingress Software without the error. You did not remove the MySQL data directory when uninstalling the MySQL server. That's why the old password is still needed to connect to the server. If you still have the old password, reinstall the MySQL server and insert the old password during the installation. If you no longer have the old password, uninstall the MySQL server and remove the folder at C:\Program Files (x86)\MySQL and C:\ProgramData\MySQL. Now you are able to proceed with the Ingress setup. We are converting from TCMS V2 to Ingress. Is it possible to transfer the attendance data and user details from TCMS V2 to Ingress? 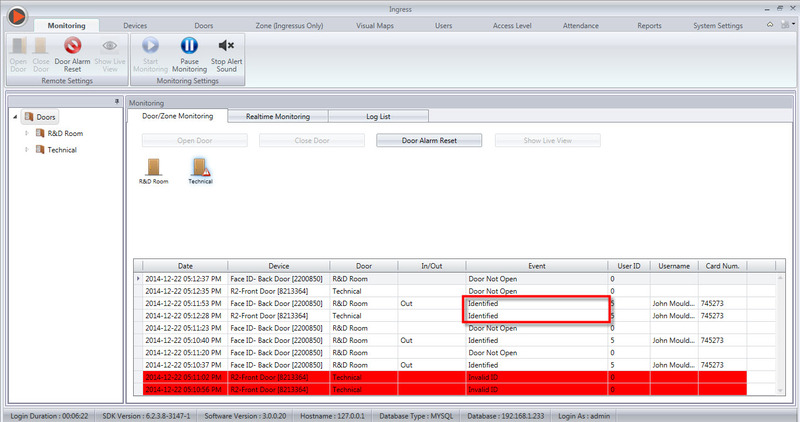 The user details can be transferred directly to Ingress using the Migration Wizard. However, the attendance data in TCMS V2 cannot be transferred directly to Ingress because both applications uses different databases. TCMS V2 uses FoxPro 9.0, while Ingress uses MySQL. 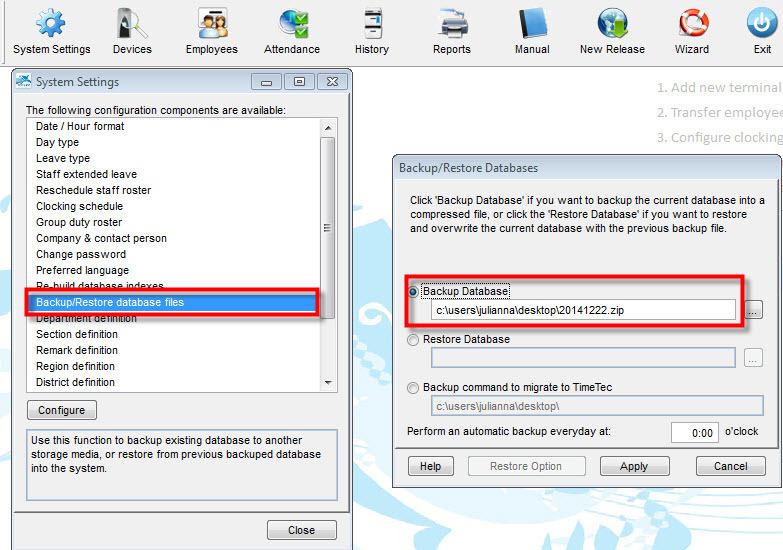 For user details, backup the database in TCMSV2. You can then import the file into Ingress using the Migration Wizard. What is the maximum number of Ingressus controller and standalone devices that can be connected with the Ingress software? You can connect up to 63 units of Ingressus controllers with Ingress. However, it is recommended to connect no more than 32 units of Ingressus controllers for performance purposes. If including the standalone devices, you can connect environments of up to 100 doors. 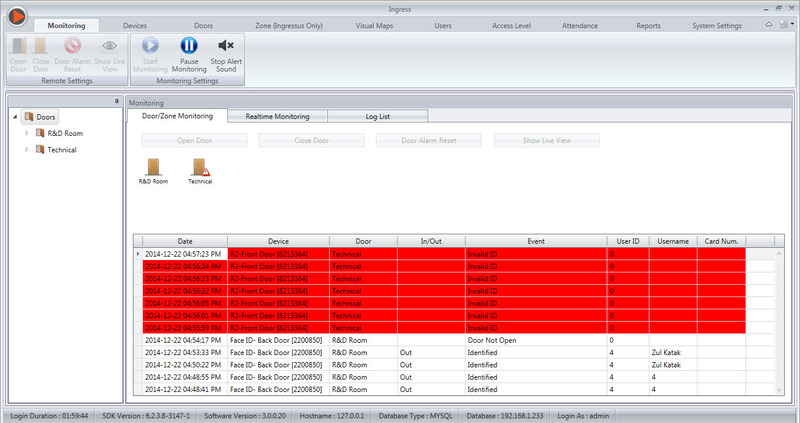 The standalone device is not displaying Real-time monitoring and Door/Zone monitoring. We are only able to properly view them after clicking Search in the log list. After adding the standalone terminal in Devices, please make sure that you add the terminal in Doors in order to get the Door/Zone or Real-time monitoring. Otherwise, you will only be able to see the transactions in the log list. Go to Doors and click Add Door. Click at the new door that you have created (named New Door in the picture below) and click Add Device. Select the standalone device that you want to add at the new door that you have created. Perform verification at the terminal and check the Door/Zone and Real-time monitoring. My network is in 10.10.1... (range) and the Ingressus controller default IP address is 192.168.1.201. How do I change the Ingressus controller IP address? 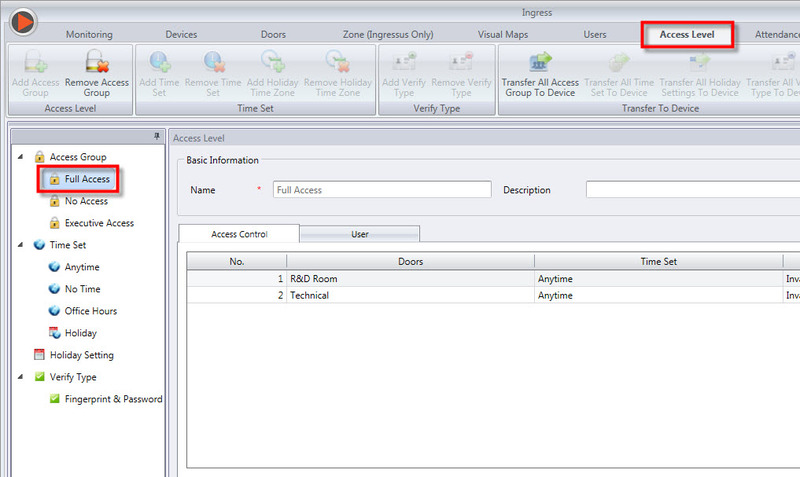 You can connect Ingressus directly to the PC. Then, change the PC's IP address with the same range, e.g. : 192.168.1.200. After that, connect Ingressus to the PC and change the Ingressus IP address at Devices > Ingressus > Edit > Network > TCP/IP Setting. Update the changes to Ingressus to complete the process. Why does Ingress keep showing the Click to sync all device info message? It will show the message if any changes are done (e.g. : change IP address, user privilege, time zone, etc.) but the changes are not updated to the terminal or controller. Update the changes to the terminal to complete the process. The door is showing as offline even though I have activated the terminal and added the terminal in Doors tab. 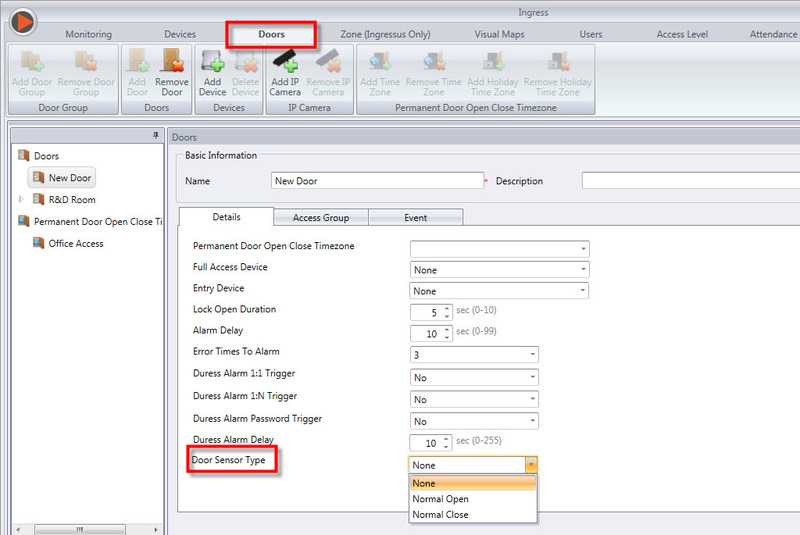 After adding the standalone terminal in Devices, please make sure that the Door Sensor Type at the Doors tab is turned on by selecting either the Normal Close or Normal Open option depending on your hardware wiring. Update the changes to Ingress to complete the process. Go to the Monitoring page to check whether the offline icon has disappear. Ingress is not able to detect users even though the users have been successfully uploaded to the terminals. Ingress will show the error of Invalid ID for RF Cards and Unrecognized Fingerprint for FP verification. You will need to add the terminal and users into the Full Access column in Access Level Tab so that the software will recognize the users in the terminal. Perform verification at the terminal and then you shall see “Identified” when you verify your fingerprint or card. Please make sure to key in the correct MYSQL Password > Click Test connection > Click Update connection > Upgrade database > Close DB Installer > Open Ingress Software. Hi Mr Carlo, Good day. You need to change the Issued date of all users to the date that you start to use the FingerTec terminal, in order for the software to recognize the older data than the installation date. To change the User's Issued date, you can go to Users> Batch Update Users > Select All Users > Tick Issued Date > Select the correct date > Save. Once done, kindly re-generate your attendance sheet, so that the changes made will take effect. Referring to the problem, please restart the Attendance Services, Ingress Service and MySQL at Control Panel > Administrator Tools > Services. Once finished, you need to run the Ingress DB Installer and completed all 3 step (Server-Test Connection, Database-Update Connection and Status-Upgrade Database). Then open back your Ingress software and check whether the problem already resolve or not. Thanks. Sir, may I know that is there any crashes between TCMSV3 and Ingress if I installed both software into one pc only? For example, I can't auto download the transaction logs in TCMSV3 now. TCMSV3 and Ingress software, can be installed the same PC. However we recommended to install either TCMSv3 or Ingress only in one PC. 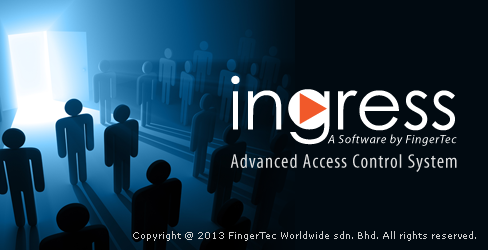 If the above steps haven't solve auto download process issue, please email to support@fingertec.com for further support. Thank you for your prompt reply & your great suggestion. i have a problem in Ingress., i have been using TCMS V2 from 2008, now i bought 4 new devices "Kadex", 15 of my old devices already running.. now i want to include new 4 devices to old device.. i mean is it possible to synchronize new device using old software?? actually i need to download the transaction logs only, from the terminal.. please help me.. to provide your potential feedback. With regards to your query, kindly be informed that the new Access control device is bundled with Ingress software, as TCMSv2 is now obsoleted. However, if you still wish to connect your new device with TCMSv2 software, you need to contact your reseller or our salesperson at info@fingertec.com to purchase TCMSv2 license key. "Failed to connect to server. at cAlehMp9F9huhCpkjh.kaIgFUZ5V7XnKs4dge.OAJF99lTDv0(String , Int32 )"
now i need to copy attendance logs value to my ERP system... Is it possible??? please suggest me, what i have to do...!!! Then, reinstall Ingress software from Control Panel, and please make sure to disable antivirus and firewall before begin installation and reboot your pc after finish installing the software. Please contact support team at support@fingertec.com if you still facing any issue as our team can assist you further.